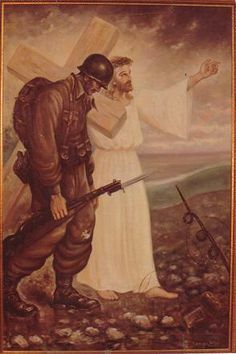 This entry was posted in Poetry and tagged American Poems, American poetry, Catholic Poems, Catholic Poetry, Catholicism, Joyce Kilmer, Poems, Poetry, Prayer of a Soldier in France, prayers, Roman Catholic, World War I on March 30, 2018 by The Mithril Guardian. 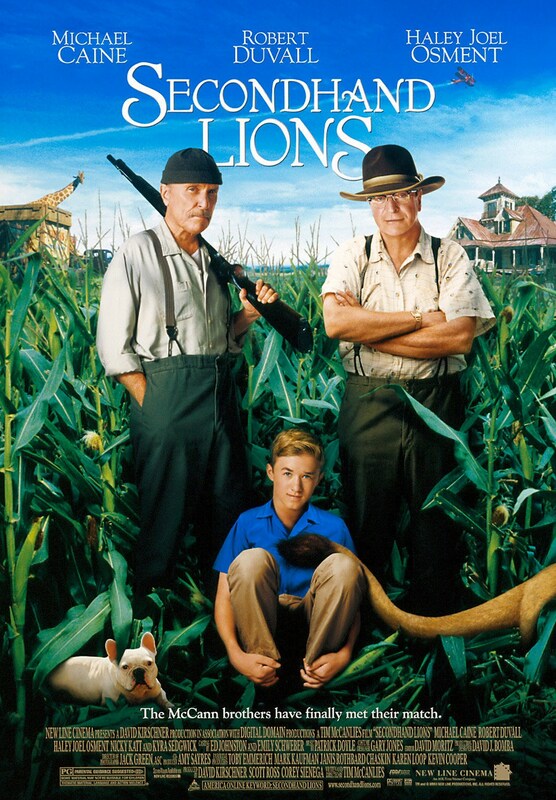 Secondhand Lions is a great movie starring Robert Duvall, Michael Caine, and Haley Joel Osment. The film takes place mostly in the late fifties or early sixties. Osment plays Walter, a young boy who lives with his mother. Walter’s mother – Pearl – is a widow who is always on the move. She has an unfortunate idea that she will be able to find a man who will have enough money to cure all her worries…. and Walter’s too, of course. And Hub and Garth can both shoot very well. In fact, when Pearl and Walter find them, they are fishing in the lake on their property. But they are doing it in the most unsportsmanlike manner imaginable. Some professional fisherman would undoubtedly groan and cover their eyes at the sight of the two old men firing into the lake with their shot guns. This is their idea of fishing. Their idea of excitement and entertainment is even better. Traveling salesmen have heard the rumors about the brothers’ fortune, and these guys can smell a dollar a mile away. They are looking to collect a little of the loot for themselves through hocking the old men some brand spankin’ new merchandise. Most of them only stay around to get shot at three or four times before packing up and speeding away. While settling into his uncles’ house that night, Walter finds a trunk with different postage notes stamped on it. Finding the key (conveniently) to the lock, he opens the chest to discover it is full of…. Sand? Soooo disappointing! And the brothers woke up the next morning to find themselves on a ship, shanghaied into the French Foreign Legion in Africa! It was after he rescued the handmaiden of a princess during one of these raids that Hub was to meet his future wife: the princess Jasmine. Living in the web of lies his mother has spun for him his whole life, Walter is thrilled by the stories Garth tells him. But there is always a nagging fear in the back of his mind as he listens to these heart-pumping tales: are they real? 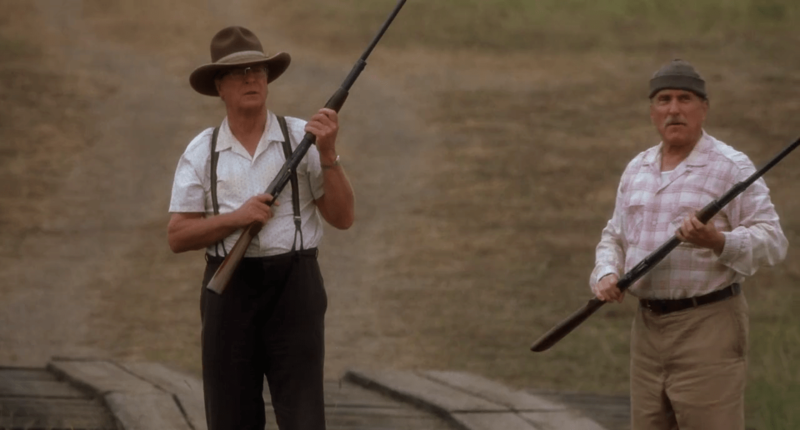 Secondhand Lions is one of the BEST films ever made. Duvall’s Hub is perfect, just like all the roles I have seen him play. Caine counterbalances Duvall well, both as an actor and in his portrayal of the supporting character/brother. The older he gets, the more it seems that we see the real Michael Caine shining through the form of the character he plays. Haley Joel Osment, a talented child actor, proves here that he can play beside the best and deliver a splendid performance. He portrays Walter perfectly. These three men make the movie great. 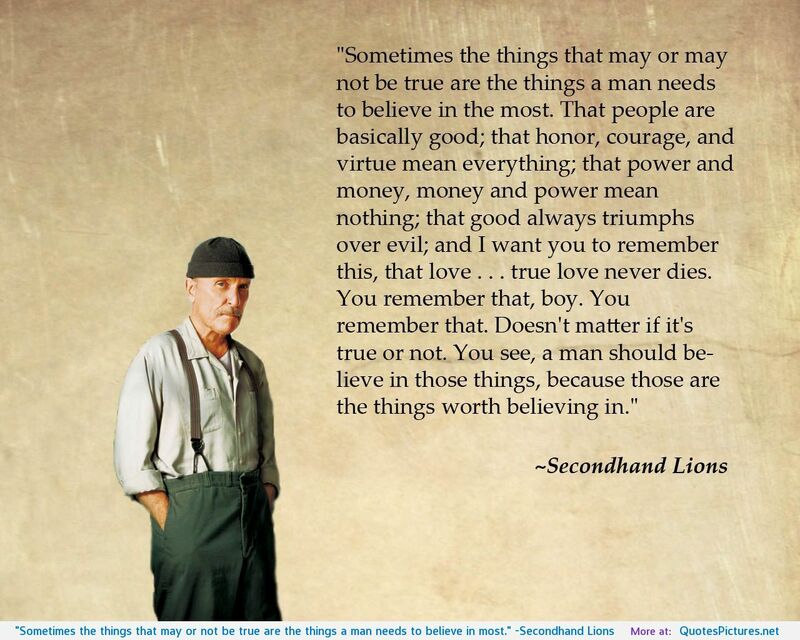 If you have not already seen Secondhand Lions, readers, do not wait another minute to borrow or buy it. The film is well worth your time and your money. This entry was posted in Movie Reviews and tagged Arabia, films, fishing, Haley Joel Osment, Michael Caine, Movie Reviews, Robert Duvall, Secondhand Lions, traveling salesman, World War I on March 10, 2017 by The Mithril Guardian.